It might seem a strange time to post about fake tan. Winter is looming so it’s not the first thing that initially springs to mind but with the lack of sunshine and colder weather I think it’s exactly the time when you need a glow to perk up those cold days. Let’s face it; everyone looks better with a little tan. 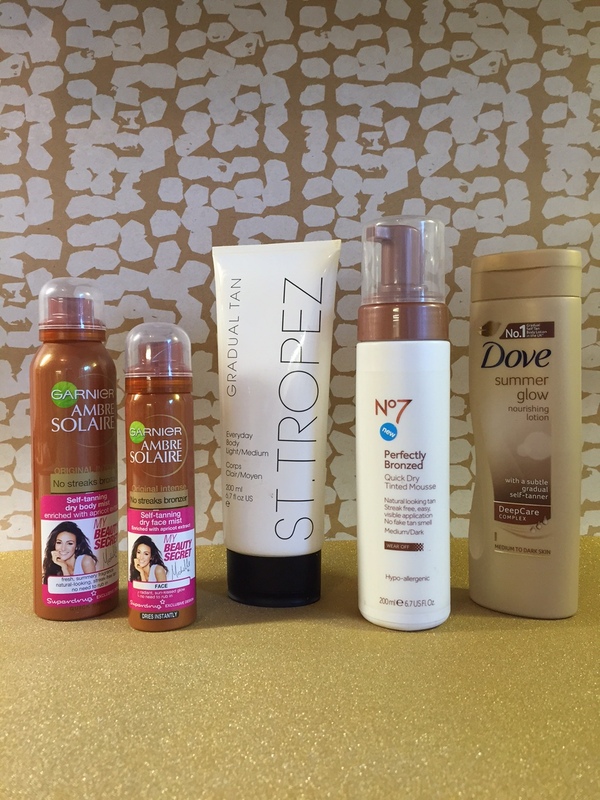 Below are a few of my favourite tans which have been purchased many times over. Pros: This is a great product. The mist is very fine so settles on the skin pretty evenly and isn’t as messy as a lotion / mousse. We’ve had a very busy summer with a lot of weddings and parties to go to and this has been my summer savior. I always find my make-up goes on smoother and looks a lot more flawless with a fake tan for a base coat. Cons: Arghhh, the nozzle keeps jamming!! Really annoying. I’m not sure if the last batch I brought was just a duff because I didn’t have this problem on the first few bottles I purchased. The face and body mist this time around are both jamming which means the mist doesn’t come out as fine or smoothly as it should. Such a shame because the actual product is great. Pros: Perfect for those days where you need to tan last minute but also have errands to run and do not have time to sit and wait for it to develop before you can leave the house. It’s not instant, it will take a while to develop but the formula doesn’t smell offensive at all and doesn’t leave your skin looking muddy. Perfect for everyday use or a top up when your tan is fading. Cons: I think this would actually work better in a pump form. You’d use less of the products and for something that you’re more likely to use every day I think a pump is better for preserving the lotion and not applying more than you need. A lot less waste. Actual product is good, again a packaging issue although wouldn’t deter me from buying. Pros: I love this! Ok, it’s messy, requires a onesie and freshly washed bed sheets after application but the colour is so worth it. This product for me is the one I go to when I’m pale, I’ve got no colour and I need that initial tan. The mousse is heavily tinted so you can see where you’re applying the product. I do really like this product and always make sure I have a bottle stashed away. Cons: As mentioned above it is messy although no more than any other fake tan mousse formulas out there. I guess this is why I only use it when I need that ‘hit’ of colour because it is a bit more work than the others but all the same the fact that I have a panic if I run out just proves it’s all worth it. Pros: A really nice deep colour after a few days of application. I buy the medium to dark shade even though I have a fairly pale complexion. Product is pretty thick but moisturising. Cons: The smell is quite strong so if you’re someone who doesn’t like heavily perfumed products this might not be for you. If you don’t mind than I’d definitely suggest you give it a go. Exfoliate regularly to remove old tan. Exfoliating gloves are great for this. Choose a skin tone that compliments your natural coloring. If you’re very fair stick to light / medium products. Use a mitt to apply the tan in circular motions. I also wear plastic gloves under the mitt to ensure the tan doesn’t get onto my hands. Pop a little bit of the product onto the back of your hands after you’ve finished applying to the rest of the body so you have an even application. Pay special attention to the knees, ankles and sides of your feet as they tend to be rougher. You can add a little moisturiser to these areas if they are very dry before application to stop the product from clinging to the dry areas. I use dove summer glow and so do lots of my family menbers it was my mum that told me to try it and she is 76,.